As I sit and type this blog, the rain is coming down on my little home in the Texas Hill Country. We’re almost at 2 inches just this morning. And while I know we need the rain, I’m ready for a break just to have a chance to photograph what remains of our Texas wildflower pictures. The last time I was out, maybe 10 days ago, the firewheels and bitterweed (reds and golds) were abundant in Mason and LLano Counties and seemed to get even thicker as you neared San Saba. The prickly pear cacti were beginning to show their colors as well. Alas, I’ll ride out the rain and hopefully find some wildflowers still around when the sun appears again. Here is a panorama of my last trip. This firewheel image was taken north of Llano. 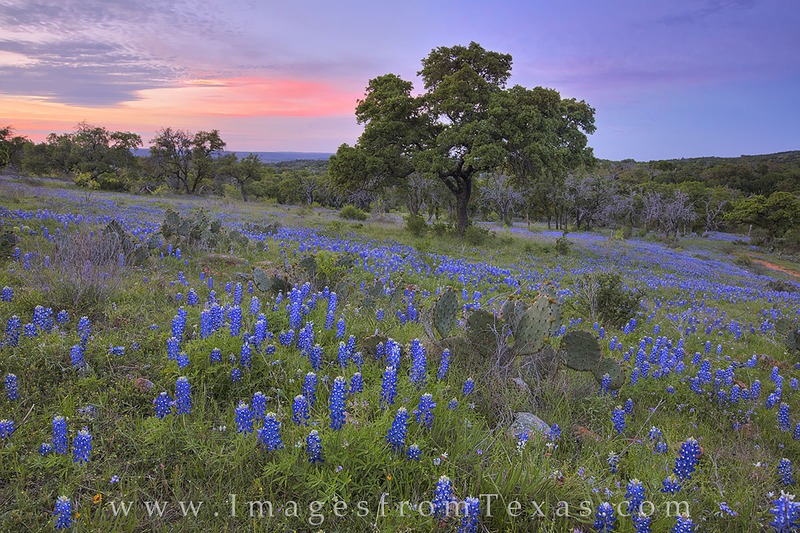 This wildflower panorama from the Texas Hill Country was taken on a May evening at sunset. I had been here a few days earlier with a friend, but the skies were clear. I returned another evening to shoot this image of an orange sky with clouds drifting by. The field of firewheels was motionless as the sun fell behind the old oak tree. Shot along a quiet road, this evening was pretty close to perfect. Bluebonnet pictures wasn’t as good as I had hoped, but there were some nice landscapes to be found. I expected the coverage of blue to be more widespread. I think the lack of rain in March held back the more prolific blooms. 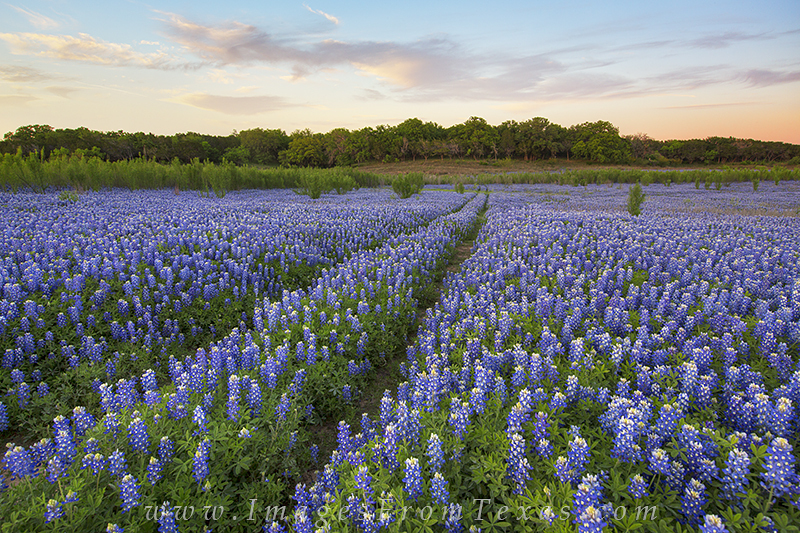 But around Lake Travis, bluebonnets filled the landscape. A narrow path of worn tracks cuts through a beautiful field of bluebonnets near Lake Travis on the edge of the Texas Hill Country. This little field of wildflowers was pristine, and I never saw another person this entire evening. * I know folks enjoy bluebonnets. A lot. I wish more people would respect the wildflowers and those people that will come after them. I saw so many places with bluebonnets completely trampled. I found a nice field with tire tracks running through the middle of it. I witnessed one woman climb over a fence onto private property to take a few photographs. 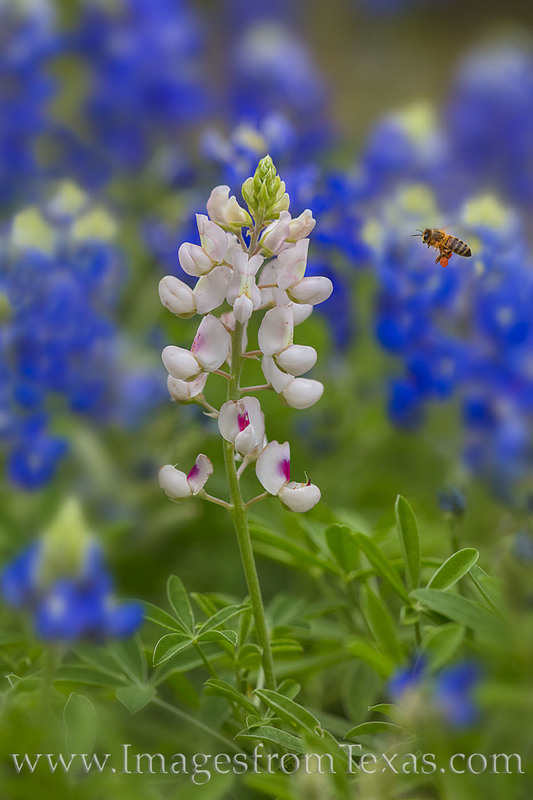 If the bluebonnets plants are not allowed to fully bloom and pass to the seeding stage, they will not reproduce the next year. I realize this doesn’t apply to everyone, but I saw enough to wince. Be respectful out there. * One of my favorite forums for wildflowers stopped sharing specific locations where the blooms were appearing. Apparently, a few dirt roads that I had traveled a few days before without encountering any cars at all was overrun with cars (50-60+ vehicles) after someone posted how beautiful the area was. And the drive was amazing – roadsides and fields of bluebonnets. But then it had folks climbing fences and mashing the blooms, leaving not much for those that would come later to enjoy the Texas beauty. I don’t know what the solution is here as far as sharing locations, but I do know how to keep the area pristine for others to enjoy. * Texas has a lot of beauty out there. Whether wildflower season or not, the winding roads of the hill country – both main roads and dirt roads – make for some enjoyable treks. One of my next blogs will be to list a few of my favorite places in Texas to shoot. * I’ve done a few photography workshops in the past, but haven’t in recent years because it seems I never have free time. I’m considering doing this again, but only taking one or two folks out at a time. I think this would be more enjoyable for all parties. That’s in the works, but I don’t know when it would start. * There are several places in downtown Austin photos I want to shoot, but again, the weather hasn’t been good for any outdoor photography unless you are doing close-ups or macros. * Recently, I’ve worked with a few families for portraits. While I normally don’t do much portrait work, I have the lighting equipment and enjoyed producing some nice images for these families. I may look at expanding this service in the future as well. If anyone is interested, let me know. I prefer to shoot outdoors and capture you in the landscapes Texas has to offer. * Heading to Caddo Lake in a few weeks. I haven’t shot there before, but I’ll have several days with a boat to explore the area. Looking forward to that. Have a good week, Texas! Posted in Texas Wildflowers and tagged texas bluebonnets, texas landscapes, Texas wildflowers on May 17, 2015 by Rob Greebon.